Kitchens are one of the most high-traffic rooms in the house, and as a result, undergo quite a bit of wear and tear. Cabinetry and countertops get scratched, nicked, and bumped, backsplashes get stained, and walls get scuffed. Fortunately, there are some things that you can do to update your kitchen, starting with the cabinetry. In fact, kitchen cabinet remodeling or refacing can dramatically transform your space. The best part is that there is an abundance of choices to meet every financial and style need. Laminate is composed of layers of paper and plastic resins and is bonded to plywood or “furniture-grade” particleboard to create the cabinetry. The majority of laminate cabinets have a grooved or flat style, as the material is not malleable. Most brands offer stock laminates in white or ivory. In semi-custom and custom lines, laminate pieces are available in many different finishes and colors. Standard laminate textures are matte, glossy, or granular. One significant advantage with laminate kitchen cabinet remodeling is that the material is both durable and affordable. Laminate also resists dings, nicks, and common stains. However, it is important to understand that laminate is not 100 percent impenetrable. The majority of wood-based cabinet boxes consist of wood veneers adhered to furniture-grade particleboard or plywood. Doors come in solid wood or veneer varieties. 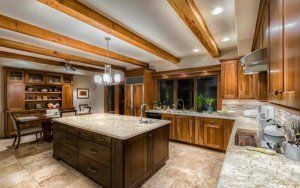 With wood cabinetry, we suggest custom collections that offer an array of styles in natural, stained, or painted finishes. The great thing about choosing wood cabinets is that you can fix most scratches, and you can repaint or re-stain them to provide new look years down the road. Thermofoil cabinets, which typically come in a variety of shapes and patterns, are designed by heating vinyl and then molding it over medium-density fiberboard (MDF). While Ivory or matte white are the norms in stock styles, semi-custom choices feature glossy textures and many colors. Thermofoil is appealing to many homeowners thanks to its affordable price tag and the fact that is available in numerous flat and embellished designs. Often in the form of stainless steel, metal cabinets are essentially veneers affixed to plywood or furniture-grade particleboard. They come in shiny and brushed metals and are available in stock, semi-custom, and custom lines. Many homeowners choose metal cabinets due to their durable, rust- and stain-resistant doors that do not become impacted by heat and humidity. Keep in mind: two drawbacks of metal cabinets are that they have the potential to scratch and dent, and they show fingerprints. Thankfully, there are numerous cleaning products available on the market to deal with smudges and smears on metal and stainless kitchen appliances and cabinetry. 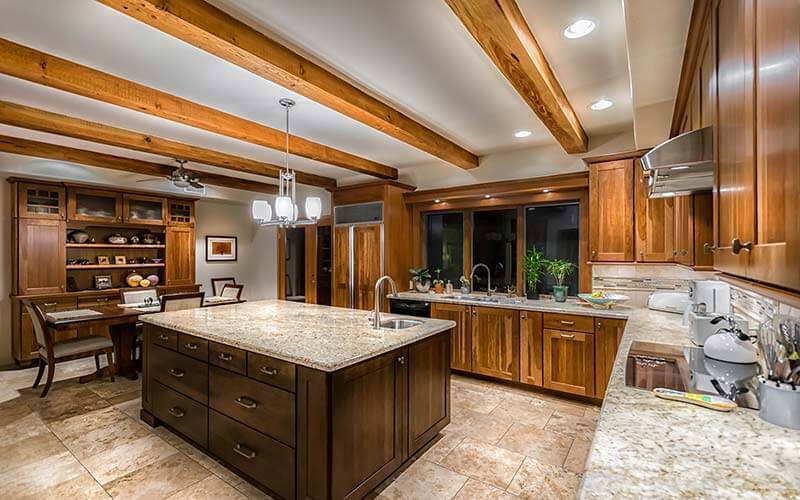 Find great design ideas and inspiration for all of your home remodeling projects, including bathroom and kitchen cabinet remodeling in our Image Gallery. And when you are ready, don’t hesitate to contact us for a complimentary consultation.